I used to think that having courage meant doing brazen, bold, and scary things that saved lives and changed the world. Over the last year I have learned that courage is really just making the right choice when given the opportunity. Today I had the privilege to share my thoughts on courage at a middle school assembly. 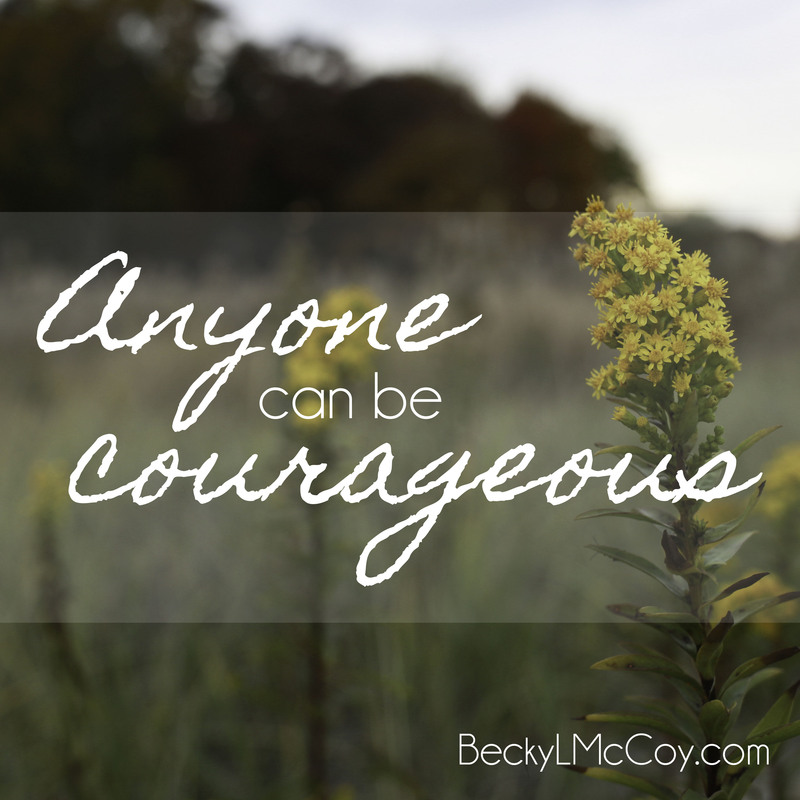 I’m never quite sure if what I have to share is universal or something I’m singularly passionate about, but the idea of this simple, daily courage seemed to strike a nerve. I was able to keep the students’ attention for 20 minutes and many faculty and staff told me how encouraged they were by my story, as well. It made me wonder how many people just need a nudge to be courageous. I encouraged the students today to be courageous in three ways. Surround yourselves with good people. Growing up, I thought that meant to avoid bad friends, but it really means to be part of a community that will keep you going when life gets hard. You need to know that when struggle happens, your friends will help you through it. I have seen what a community does for the members who are hurting. I’ve been a recipient of that kind of help. Don’t think for a second you can handle the tough seasons of life without that help: those moments will crush you if you try to get through them on your own. Don’t ever give up because you feel inadequate or success seems impossible. 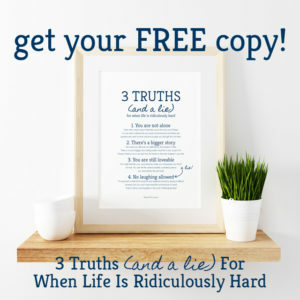 Some challenges in life won’t get easier, but that doesn’t mean they’re not worth pursuing. When I think back to some of the major challenges I have faced, I’m always thankful that something in me said to keep pressing on. 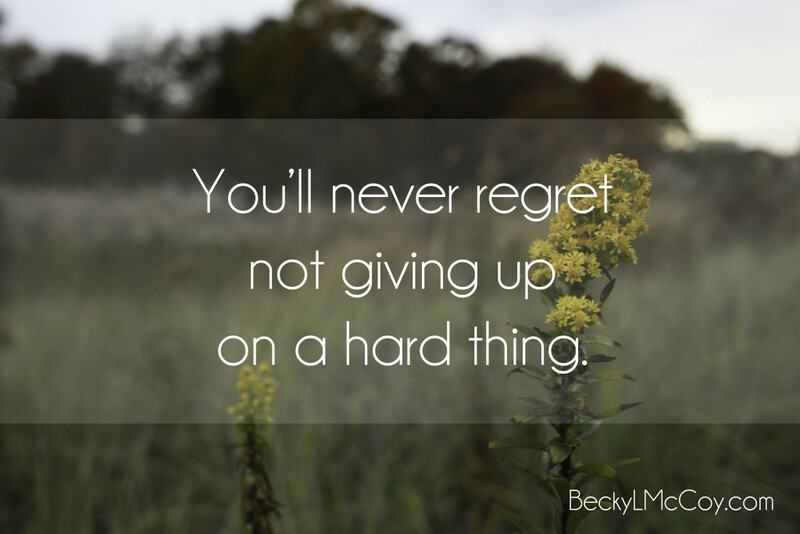 You’ll never regret not giving up on a hard thing. When the hard times in life come, speak up. Tell someone you’re struggling. No one is immune to crisis, loss, or struggle; life is hard for everyone. Somehow, we’ve come to believe that admitting something is difficult is a sign of weakness and something to be ashamed of. If you’re struggling and you need help, speak up. I didn’t want to leave the middle school students today without encouraging them about what really matters. When I think back to my own middle school experience, I don’t remember what clothes people were wearing, what grades people got, or how they performed in any other arena of life. I remember how they treated me. What kind of impact do you want to make? Does popularity, trendiness, intelligence, or athletic ability determine a successful life? Or do you want to be remembered for your kindness, tenacity, loyalty, and courage? It’s so tempting to think that middle and high school students are the only people who lose sight of what’s truly important. Don’t get stuck doing what’s easy; courage is worth it. When courage means to make one small, right choice after another, anyone can be courageous. Sometimes courage is having no other options. There are times when I’m appalled that people think I’m brave, based on what I write. I’m not. I simply have to keep going, because time passes for me as it does for everyone else, and you’ve got to do SOMETHING. 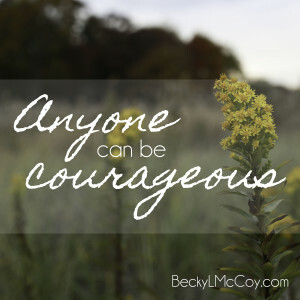 But I think you are truly brave, Becky. I wish I had a tenth of your courage and character. I agree. It’s like when people say “you’re so strong”. It doesn’t feel as though I’m all that strong or that I even have a choice. You just keep moving. I owe you an email reply – I haven’t forgotten! These kids are very very fortunate to have had such a speaker! No question they carried something away from you and all you had to share, Becky. I’m Becky from the Connecticut coast where I live with my two precocious and hilarious children. Once, I was known as the Dancing Physics Teacher, but now I tell my story of loss, grief, and joyful living. Having struggled with depression and anxiety and experienced several seasons of grief and struggle, I’m passionate about creating an online community where people share their stories and encourage one another to choose to live bravely and authentically through disappointment and discouragement. © 2018 Becky L. McCoy. Site by Micah J. Murray.